I was clinging to life yesterday, what with an intermittent drippy nose and a congestion headache invading my otherwise stellar health, and from beneath my snuggly blanket, I kept hearing lyrics from a John Hiatt song, over and over in my head. Cyndie and I have taken turns caring for each other over the years, and when it’s my turn to be the patient, Cyndie becomes an angel of mercy for me. 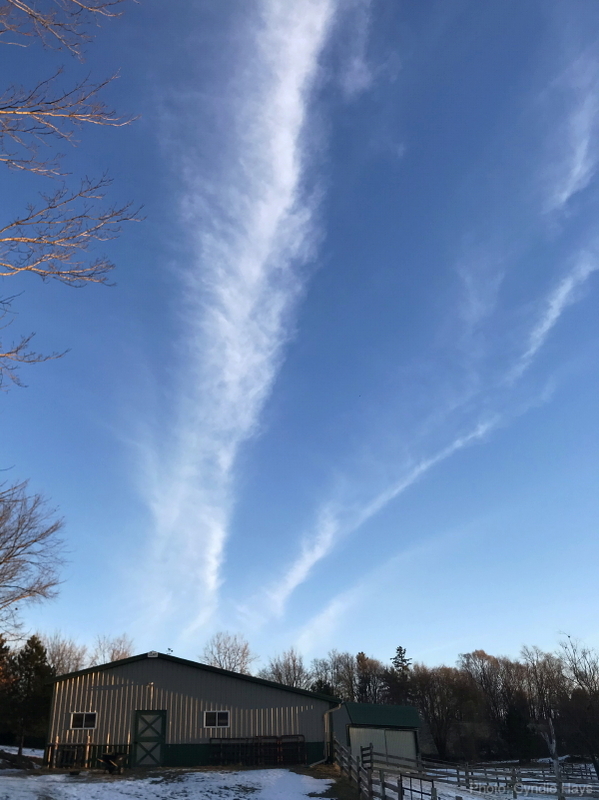 She took this picture yesterday morning that gives the impression of some kind of energy emanating from our barn. I expect it is a couple of dissolving jet contrails that painted the morning sky in such dramatic fashion, but I’m happy to imagine that it means something about our place. Love is one of the pillars by which we live our lives, and it continues to inspire our imaginings of what might be possible on our precious property in the rural countryside. The last few years have been a struggle, in a variety of unrelated ways, not the least of which was the passing of our herd-leading horse, Legacy. The ongoing painful dysfunction of our government that for over two years has been providing a daily scourge of depressing results hasn’t helped, either. Cyndie and I are in a bit of a holding pattern as to what comes next. It was a response to her discoveries working with horses, and our time spent with Ian in Portugal that brought us to this property. I was happy to join her in this adventure to unknown possibilities. I’m not sure what comes next, but it seems to me that it would likely have a focus that emanates from that barn. Whatever it is, it will be infused with a real fine love. I just finished reading this to George C as we make our daily treak to JGESA. We know about “holding patterns.” One thing we Have learned is…what has been is part of what needs to be. Thanks for the morning inspirations! Thank *you* for adding your perspective!